Lobby of the Pinnacle in the Pearl. 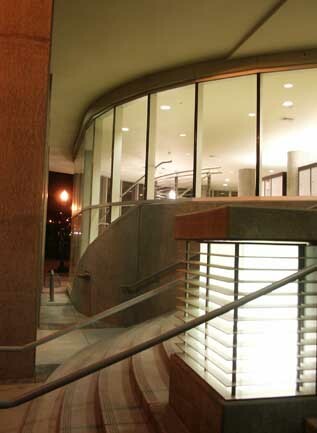 lass is slick, does neat things with light and defines modern architecture. It also begs to be looked at ... and through. In the last five years Portland has gained a lot more glass and it's not just in the architecture. 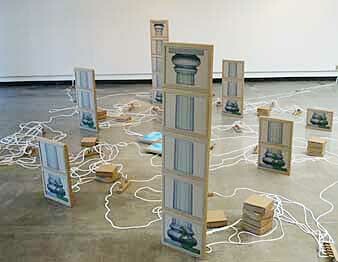 Suitably, nowhere is the "look and evaluate" more prevalent than in Portland's rapidly evolving visual art scene. Now September is upon us and that means the perfect storm of art activities is upon the once sleepy Northwest city of Portland, with Affair, TBA, Portland Art Focus, Troca Brasil, etc. Things will only get better in October with the opening of the Portland Art Museum's Center for Modern and Contemporary Art. Actually, before the latest wakeup call, Portland wasn't always sleepy. Back in the late 1800s and early 1900s it was a creepy place where you might enjoy a drink and then suddenly wake up with a headache on a ship bound for Shanghai. Back in the early 1900s (when Seattle was clearly giant steps behind) the West Hills grandees were collecting Monet, Gauguin, Picasso and Brancusi. They built a museum, hosted the armory show as it traveled and apparently knew legendary art dealer Curt Valentin well enough to receive a nice Ernst Ludwig Kirchner painting as a gift. Now the new condos, restaurants and art boom in town are creating a new see-and-be-seen cultural transparency in the city. Instead of Portlanders traveling to Paris, Parisians have a reason to visit here. Even the new Roy Lichtenstein brushstroke sculpture mocks the very star of the new museum wing, the Greenberg Collection (which has some good stuff but is in many ways more important historically than aesthetically). James Lavadour in the Henry's lobby. In this new Portland, where even the museum can laugh at itself publicly, it isn't tough to find out who donated what to which organization. This is Portland's new philanthropic paradigm shift toward public support. The change is in effect and instead of the old behind-closed-door Masonic lodges of the '50s, things have taken on contemporary transparency and we can tell who collects boring French posters in the Pearl and who has a good eye for contemporary art. 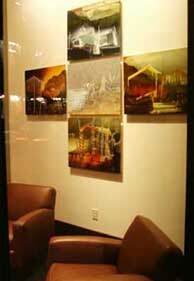 All this can be done simply by looking in the windows or paying attention to who buys what at the galleries. Even the various high-rise condo lobbies and restaurants in the Pearl are becoming visual events, like the new Pinnacle condo or the subtle entrance for the Henry, which sports five fine James Lavadour paintings. Still, the better artists in town tend to have more edge than the dealers and collectors who form this interesting Bermuda Triangle where gallery art disappears until the artists (if they are lucky) get displayed in the museum. Will the collectors get edgier or cheesier? The good thing about all this cosmopolitan consumption is that very little stays secret (if you are in the loop). This organization will lead to bigger things in coming years. Question is, will the leaders active right now seize the moment with more glass or go for more creme-colored brick? Bovee and Blanc at the Northview Gallery. The most sophisticated August show in Portland was by the young husband-and-wife team of Katherine Bovee and Philippe Blanc at PCC Sylvania's wonderful Northview Gallery. The gallery sports some great brutalist architecture, characterized by extensive use of cast concrete, glass and two long white walls that frame a big window. In this setting the Northview seems to swallow the exhibition whole, but that's part of its sophisticated charm. Instead of addressing the space, the numerous cardboard surrogates for Macintosh computers are clustered in one corner of the gallery space. At first I was annoyed with the insular arrangement, but in time I noticed how the work seemed to ignore the real world and focus on a series of familiar yet strange contemporary fetishes, most of which were analogous to computer-geek culture. To further the pun, geek columns (I mean Greek columns) appear on the idealized computer screens and hearken back to computer games like "Civilization," which fetish the look of Hellenic civilization without exploring it philosophically. 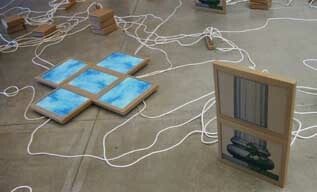 Another contemporary art fetish is the use of cheap materials, in this case cardboard and clotheslines, as surrogates for computer plastic and wires. This use of materials seems to comment on the trope rather than utilize it and, at first, one wonders if this is just an uber-chic computer design that only looks like it's made of cardboard ... sort of like those cell phones with soft-knit covers. The comment is a kind of academic absurdity. It is a Dadaist combination where the utility of form is defeated by focusing on the physical form as a way to nullify the philosophy that led to the design in the first place. The end result of "Boxed Set" is an interesting parallel between ubiquitous Dadaesque currents in contemporary art (like uselessness and cheap readymade materials) and geek culture's fetish of nostalgia, be it Greek civilization or outdated computers. What does it mean? Ha! Despite its appropriateness here, Bovee and Blanc's next show needs to address the space rather than ignore it. Still, Boxed Version is a dramatic increase in sophistication for these two young artists, putting them in league with only a select few contemporary Portland artists who preserve the enigma that keeps really challenging art interesting.